Sweet Creek Foods fills a unique niche in our local food system. Working with our local farmers to grow organic produce for our own product lines as well as offering small scale co-packing services to our partner farms is what we are all about. One day we will be making our pickled beets and the entire processing area is a beautiful shade of purple then the next day will be steam juicing blueberries for a small farm so that they can offer cocktail mixer made from their local organic berries. One of the best parts of our business is the relationships built with our local farmers and small-business people, getting to see their fresh produce come in one end and a custom made preserve come out the other. From our kitchen to your table we strive to provide our customers with products made from ingredients sourced as close to home as possible. We value our local farmers and fishermen and believe that through working together we can all secure robust local food systems that will continue to provide our communities with safe, healthy foods for years to come. Paul and Judy Fuller are proud to be the creators, heart and soul of Sweet Creek Foods. 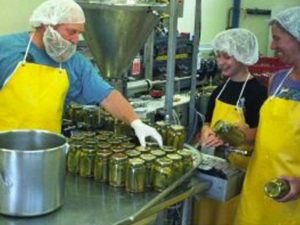 When they met 25 years ago Paul bought a 41 quart canner and they preserved an array of home canned foods each year. They’ve enjoyed many beautiful organic gardens together, planting, harvesting and preserving their abundance. Sweet Creek Foods has taken Paul and Judy’s organic way of life to another level. Their son Zach grew the cucumbers for “Pauls’ pickles” for the first three years using all organic methods and did a wonderful job. 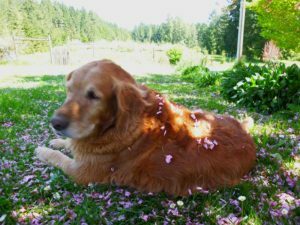 Cody has always been the mellow one and will help out when they need him. 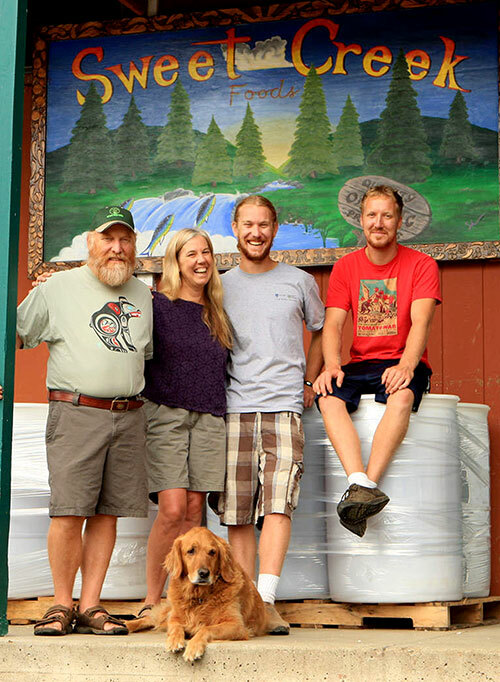 As Paul and Judy started to expand Sweet Creek and make new products using local ingredients from farmers in their area their son Zach moved back from bend and since has become an integral part of the business, managing the crew, developing new recipes and doing the graphics for new product labels. Maggie (the dog), acts as the company mascot and greeter, she is always ready to receive a cookie in exchange for her services. When we’ve worked all day she reminds us of the simple pleasures, that we need food in our belly and a good head rub is always enjoyed. Judy does the books and works with her assistant Jen Lynn to take orders and process the paperwork. They work together to make sure that the office runs smoothly and provides the kitchen crew with the information they need to operate happily and efficiently. Paul is the brains behind the wonder of mechanics that Sweet Creek has become. Buying equipment and making custom equipment is his speciality as well as an amazing myriad of other things. Paul is the inspiration for Sweet Creek and has really put his heart into it. Paul and Judy make a fun and wonderful team. Together with Zach and the crew they focus on preserving the bounty of local produce so that you can enjoy it year round They hope that you enjoy being a part of our local food system and are proud to have their organic preserves be a part of your pantry and dishes on your table. Their son Zach grew the cucumbers for “Paul’s pickles” for the first three years using all organic methods and did a wonderful job. Cody has always been the mellow one and will help out when they need him. As Paul and Judy started to expand Sweet Creek and make new products using local ingredients from farmers in their area their son Zach moved back from bend and since has become an integral part of the business, managing the crew, developing new recipes and doing the graphics for new product labels. Maggie (the dog), acts as the company mascot and greeter, she is always ready to receive a cookie in exchange for her services. When we’ve worked all day she reminds us of the simple pleasures, that we need food in our belly and a good head rub is always enjoyed. Judy does the books and works with her assistant Jen Lynn to take orders and process the paperwork. They work together to make sure that the once runs smoothly and provides the kitchen crew with the information they need to operate happily and efficiently. Paul is the brains behind the wonder of mechanics that Sweet Creek has become. Buying equipment and making custom equipment is his speciality as well as an amazing myriad of other things. Paul is the inspiration for Sweet Creek and has really put his heart into it. Paul and Judy make a fun and wonderful team. Together with Zach and the crew they focus on preserving the bounty of local produce so that you can enjoy it year round They hope that you enjoy being a part of our local food system and are proud to have their organic preserves be a part of your pantry and dishes on your table.